This is the first time seeing this so I was excited to be able to experience it. Like I have always stated I enjoy going into movies I had no knowledge of or any idea of the plot. Kind of like a clean slate, which I enjoy the most. Twilight Time has picked many movies that I have never had the privilege of experiencing. Thankfully seeing these movies for the first time on high quality transfer’s and Blu-ray wonders is a priceless example of how to treat film. Twilight Time always gives amazing experiences with their products. This is a romantic comedy. A wonderful acted film. Based on the novel Chilly Scenes of Winter by Ann Beattie which was published in 1976. I think what is interesting about this film is the trivia behind it. This came out originally titled Head over Heels. 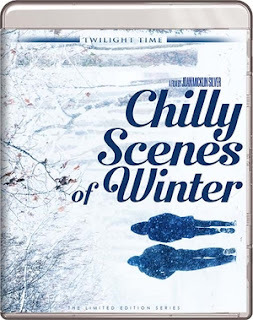 In 1982 they decided to release it again retitled Chilly Scenes of Winter, which they also changed the ending. The second time around it basically was more of a box office success then the first time. The plot is about Charles Richardson who happens to be a civil servant in the 30’s. He works in Salt Lake City Utah. Well as you would guess in a romantic film, Charles notices Laura Conley in the filing department of the place he works, and like all good classic love stories, it was love at first sight. Now Laura happens to be married but is separated from her husband. She has moved out from her husband and is in the process of finding herself. Well as you would guess it Charles builds up all the inner strength, or love struck reality to approach and ask Laura out. Basically in modern terms they hit it off. Soon swoon and love affair. But Laura is not happy because she feels Charles loves her too much, or she is not able to accept that someone can cherish another as much as he does. Soon the two are separate and Laura cannot make her mind up about her husband or Charles, so begins a twisted triangle of love, passion and finding peace in one setting. This stars the wonderful John Heard who I feel has always been an underrated actor. He shines in this part of Charles. Heard is spot on in this role like he tends to always be. A wonderful character exploration. A spot-on reality of a man in absolute love and finding one’s place in a crazy world of emotions and relationships. Also starring the amazing Mary Beth Hurt as the main female lead Laura. She like Heard is spot on brilliance in her role. Both play off each other with perfect chemistry and clarity in understanding there characters and making you believe there characters. Also starring the absolutely fabulous, and one of a kind star Kenneth McMillan in the part of Pete. McMillan never got the stardom or the house hold name reality, although most will always recognize his face throughout his performing years. Sadly, he died at the young age of 56, but left the cinema world with countless memorable characters. Often a villain, and a true master of that style of acting. I will always remember him as the one and only character of Baron Vladimir Harkonnen in the one of a kind sci-fi masterpiece, David Lynch’s DUNE. Started working in 1969 and did so unto his death. Many times uncredited in film, but always a wonderful sideline actor and character actor. Another classic he starred in was 1979’s horror classic Stephen King’s Salem’s Lot as Constable Parkins Gillespie. Another defining character was Cressner in Stephen King’s 1985’s Cat’s Eye. I just love seeing him no matter what style his role. Twilight Time has honored another one of his films on a beautiful amazing Blu-ray, Runaway Train. Which you can read my review in the Twilight Time section. Directed by a wonderful female director Joan Micklin Silver. She directed the wonderful 1975 Hester Street which also was her first feature length film as director. It also garnered a Oscar Nomination for actress Carol Kane. She has directed many TV movies. She also directed one of my favorite silly cheesy comedies 1989’s Loverboy starring Patrick Dempsey. A wonderful transfer. Crisp audio and video. A wonderful clarity. The movie looks fantastic or at least what I experienced. I have never seen this film before but I can’t imagine it being any better then what it is. Twilight Time has done a lovely job on audio and video. "Music can be a cinematic or theatrical drama's emotional unconscious, a sensory element that supports the audience's suspension of disbelief. The music must create and join with the audience's emotions by blending a drama's characters with the central storyline." He has worked on many films as composer or arranger. He also helped on another movie released by Twilight Time The World of Henry Orient. He is a wonderful master at his craft and this special feature helps showcase that beauty. Audio Commentary with Writer/Director Joan Micklin Silver and Producer Amy Robinson. This is a great listen hearing from the director herself. It’s always wonderful experiencing the reality of a film and its history and interesting trivia coming from the ones who created the film and this commentary is that. A priceless listen. As I always state, Twilight Time has done it again choosing a forgotten film to a lovely new outlet. A perfect Blu-ray transfer. A great Audio Commentary. A wonderful 1080p perfection. A lovely story. A great Blu-ray to own and a film to experience. Highly recommended.